After the fence, the second priority was our master bathroom. When we bought the house, the shower in the master bathroom wasn't functioning. The previous owner was sure that a new shower pan was needed under the tiled shower floor, and several tiles had broken around the drain. She didn't want to fix it and had been showering in the guest bathroom. Our inspector came to look at it during the home-buying process, and we got an estimate for $1,500 to replace the shower. We were able to negotiate $1,500 off the price of the house in return for the shower problems, and we were satisfied with that. When we moved in, my dad (whom we consult on all things having to do with fixing/renovating the house) wasn't sure that a whole shower pan was needed. He thought the drain might just be clogged so badly that it messed up the rest of the shower floor. 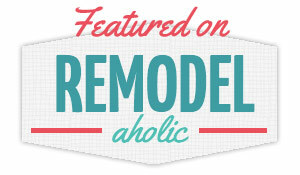 We bought a plumbing snake and fished out an incredible amount of hair from that drain– gross, I know. That hair was the best news we had received, though, because it meant we weren't going to have to spend $1,500 to replace the shower. More money in our pockets=happy dance! It should be noted that the master bathroom was intended to be my bathroom, not a shared bathroom with the husband. As soon as we saw the size of the bathrooms, we immediately decided we would both set up shop in one and not bother each other. Just like with our closets, I claimed the one attached to the master bedroom and he was relegated to the guest bath. Because of this arrangement, the style of the bathroom was completely up to me. The only thing that I knew was I wanted it to feel bigger. In my mind, that meant light colors- lots of white and cream to really open things up. I also really wanted a piece of floating glass to enclose the shower instead of the framed door. The first order of business was to remove the bulkhead above the shower. It wasn't accomplishing anything architecturally aside from closing in the shower and making the room feel much smaller. My dad and Scott ripped out that bulkhead, patched it up to match the ceiling and moved on to the next step. The decision was made to tile over the existing tile instead of ripping it out, but we were planning to tile all the way to the ceiling this time, instead of 3/4 up the wall. I went to a local tile warehouse and picked up a beautiful neutral ceramic tile that reminded me of natural stone (without the price). 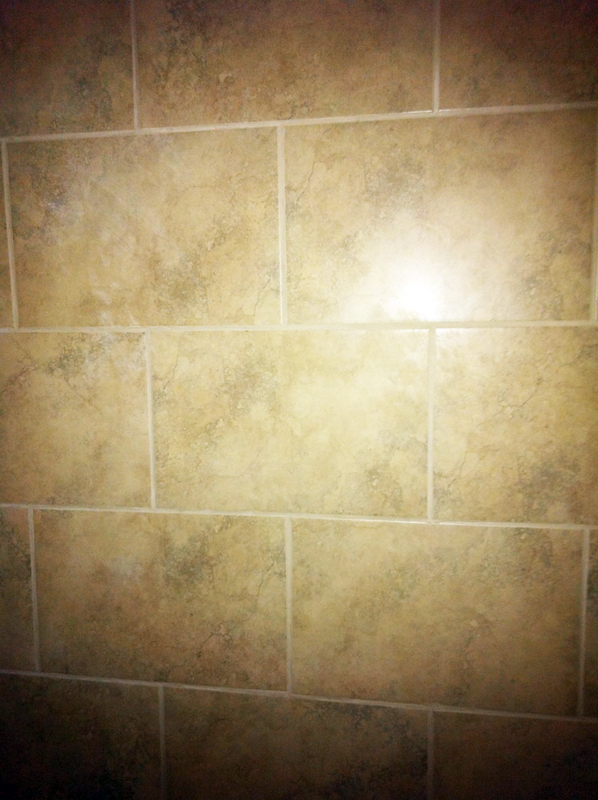 I picked a square 12x12 tile for the bathroom floor, an oversized subway-style tile for the shower wall and some tiny squares for the shower floor (to make it less slippery). My dad taught Scott how to install the tile, and they worked all day. My parents live three hours away, so they left and Scott was on his own to finish it. This is the subway-style pattern we went with on the shower wall, all the way from floor to ceiling. 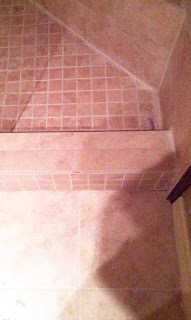 This is a view of the bathroom floor, shower floor and shower seat. You can see the different tile sizes that Scott and my dad used to make it all come together. I also painted the existing mirror white to match the vanity and found a file storage unit at HomeGoods that I decided to use to hold my hair spray, makeup, face wash, etc. I'm a messy bathroom girl, so the more storage I have, the better. I also painted the walls a color called "Java." I found a gallon for $5 at Lowes and jumped on it! Oh, and we replaced that wooden toilet seat, too! Add in a beautiful chrome faucet, a chrome toilet paper holder and a chrome trash can, and things were starting to come together! Doesn't it look awesome and keep the room feeling much bigger than before? I think so! That shower head was our latest purchase. The previous shower head was shooting water straight out and we needed one that went more down now that we only had the glass nearest to the shower head. We made the switch to a chrome shower head (and the ability to manipulate the shower head and pull it off to wash our fur-babies is an added bonus). The bathroom is still not quite finished. We want to add a light above the vanity and a vent into one of the pocket lights on the ceiling. My dad is coming next on Thanksgiving, and those two projects are on the top of the list. A little turkey and some light installation- sounds like a normal Thanksgiving to me!